In the summer of 2010, the Chicago Community Trust (CCT) commissioned Hubbard Street Dance Chicago (HSDC) to undertake a project to better understand dance education programs offered to Chicago Public School (CPS) students by outside organizations, as well as how they are using the newly released CPS Guide for Teaching and Learning in the Arts. Along with HSDC, three other organizations were commissioned to complete similar projects for the arts disciplines of visual arts, music and theater (The Art Institute of Chicago, Ravinia Festival and The League of Chicago Theaters). The overarching goal for the initiative was to identify how arts organizations can more effectively serve CPS students through arts education programming. 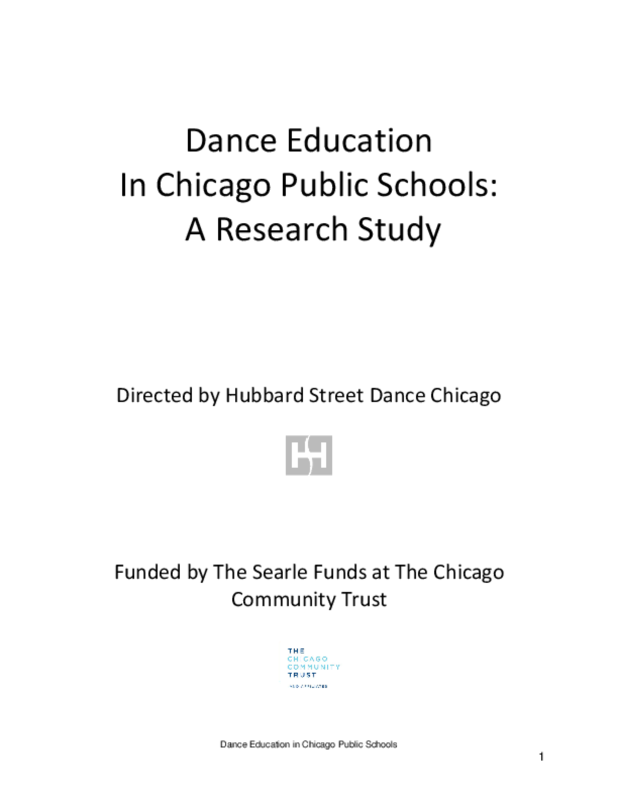 Specifically, this included a better understanding of the current capacity of dance education organizations as well as factors that could improve the quantity and effectiveness of dance education programming for CPS students. Copyright 2011 Hubbard Street Dance Chicago.